Cidhna Mine is a forced-labor prison camp underneath western Markarth containing silver ore veins. 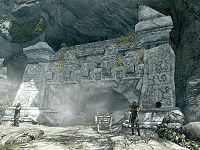 The mine has two interior zones: Cidhna Mine and Markarth Ruins. It is owned by the Silver-Blood family and used as a prison to house prisoners for Markarth. The silver ore deposits are mined by the prisoners day and night, who only receive food on a weekly basis when they have met their mining quota. According to most, Cidhna Mine is considered to be the most feared and secure prison in all of Skyrim. If you go to the mine as a free visitor, Urzoga gra-Shugurz will talk to you and remind you to keep out. She may tell you something about this mine. "This is a jail, owned by the Silver-Blood family. We use the prisoners to mine for ore. It's the most secure prison in Skyrim. Throw scum in, close the gates. No one gets out." In fact, she and some Silver-Blood guards here are not real guards. The Silver-Bloods pay their wage. Every man is a trained mercenary. If you are here as a prisoner, you will enter through a double set of locked gates that can't be interacted with, so you can't pick the lock to escape. At the top of the wooden structure there is a ramp down to your right, over on your left is a hay bale. The cavern has three exits, one of which is through a gate guarded by Borkul the Beast. In the center of the area is a fire pit with Uraccen sitting next to it. If you speak to him, you can find a lot of useful info regarding the other residents. There are pickaxes throughout the mine. The tunnel to the south leads to an open area where Odvan and Grisvar the Unlucky mine. There is a silver ore vein in front of you as you enter. Odvan has a bottle of skooma that can be pickpocketed. The tunnel continues to the south, it twists and turns until opening out again. There is a silver ore vein on your left as you enter this area and you will find Braig here. He also has a bottle of skooma that can be pickpocketed. Taking the tunnel north from the main cavern, you will pass over another silver ore vein on the floor. The tunnel continues to a junction, a dead end to your left has a silver ore vein on the north wall. Turning right at the junction you will pass a table as the tunnel turns back to the north. There is a barrel and cart, as well as another silver ore vein on the floor. This is where you will find Duach. Through the gated tunnel to the east, the tunnel takes a couple of turns before you pass a short tunnel to a dead end on your left. This is followed by a locked gate blocking a tunnel to your right that requires a key. The key is carried by a guard who stands by the two iron rings. Through the locked gate, there is a small cave room. There is a table with two leveled weapons on it, a small and large coin purse, and some gold. The room also contains the two evidence chests. There is then a cupboard with some potions (two potions of extra magicka, three potions of regeneration, and a potion of enhanced stamina), a bottle of wine, a respawning apothecary's satchel containing uncommon ingredients, a copy of the Lockpicking skill book Proper Lock Design, a bottle of alto wine, and two small coin purses. The main tunnel then ends in the room used by Madanach, which contains three sacks of food, a bed that you can't interact with, a respawning empty chest, a chair and table holding a bottle of wine and a honey nut treat. There are two barrels behind the table with two bottles of wine, a bottle of alto wine, a sliced goat cheese, a garlic bulb and a small coin purse. There is also a rabbit hanging above that can be harvested. Nothing in this room is owned and all can be taken without penalty. When escaping through the previously locked gate near Madanach's room, the tunnel heads south, east, and then south again before you come to a Dwemer door. There are two sacks on your left and the door leading into Markarth Ruins. Through the door and into the ruins you will see Dwemer architecture all around you. Following the tunnel you will pass a couple of empty Dwemer shelving units, chairs and benches. Eventually the tunnel opens out into a cavern with stairs off to your right leading up to a higher level. You then enter a corridor that turns to the southeast, leads down and then turns back to the north. You will see cobwebs ahead. The corridor turns east, then north again and you will encounter a frostbite spider, there is also a respawning spider egg sac that can be harvested on your left. Further down this corridor it opens out into another cavern, with stone pillar in front of you. To your left on a higher level is another frostbite spider. You can reach it by going around the right of the pillar and up an earthen ramp to the left. There are stone stairs in the southeastern corner of the cavern, but they lead nowhere. The exit tunnel is in the northern corner. Follow the twisting tunnel up some stairs to a raised platform which has two leveled dwarven spheres. At the end of the platform is a docking station for a dwarven centurion. There are stairs down to the lower level on the eastern side. Follow them down, but then turn left and under the platform you will find a Dwemer shelving unit containing a potion of minor magicka, a potion of plentiful healing, a Dwemer pan, a Dwemer plate, a Dwemer cog and two silver ingots. Further along the same wall is an unlocked respawning Dwemer chest containing leveled items. On the opposite side of the room is a bench. To continue forward head north up more stairs into the final area with another stone pillar in front of you and an earthen ramp to your right. Follow this up and you will see the exit door to the north. In order to be set free, you must serve your time by mining silver ore. You cannot pickpocket the key or otherwise escape. The mine has six silver ore locations, but only five during the quest and some re-spawning silver ingots in the guards entrance. In order to access the mine other than during the "escape" quest you must be arrested in Markarth and ask to go to jail. For your very first arrest Urzoga will explain how things work. For subsequent arrests, going to jail results in a newly spawned accessible silver ingot in the entry on the table to the left. After picking up a pickaxe all of the silver ore veins below the entry just trigger the serve-your-time exit message. There is also a respawning pile of steel and silver ingots in the nearby blacksmith's workshop in Markarth. The Silver-Blood guards will not arrest you, they will send for the city guard if they catch you stealing or lockpicking and attack you for anything else. If you leave the mine using the Whirlwind Sprint shout you will become blind in a similar way to the effect of reading the Elder Scroll until you enter the mine again normally. ? The ore vein directly above the 3 pickaxes near the fire does not appear until after escaping the mine and returning. However, even after it appears, it is not mineable by any means. It acts as a bed even when attacked with a pickaxe equipped. While in the mine, many sounds may stop working correctly; such as those associated with picking up objects from the floor or a container, moving items to/from inventory, and footsteps. This page was last modified on 27 December 2018, at 01:41.